Ah, toxic masculinity. Every time we see it, we can’t help but roll our eyes. It seems as though over the years, men are getting worse at taking rejection. No matter how many times a woman says “no,” or how politely she says it, these men just can’t handle the idea that a woman doesn’t want them. 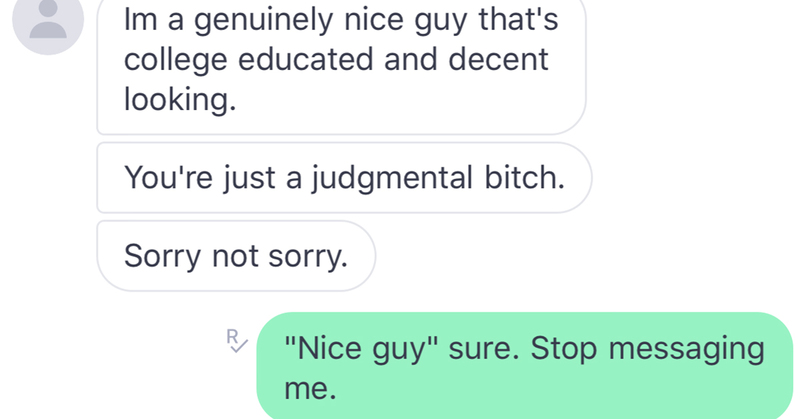 This time around, Imgur user princessapple shared a text thread with a guy she had met on Tinder. It goes from bad, to worse, to oh my god, just stop. The guy, “Gabe S,” had messaged her saying he saw her on Tinder but thought it was easier to message her here–which I believe is another social media platform like Instagram. However, Princess Apple wasn’t interested and politely said no. Ironically, after his “I think you might like to talk to me because Tinder is full of men sharing d*ck pics,” Gabe S sends none other than…a d*ck pic. Princess Apple is still not interested. But, Gabe S goes on to say how big he is–precicely. Princess Apple is still not into it. Gabe S continues on his toxic voyage of “I bet you’ve never had a d*ck like mine,” rant, but Princess Apple politely turns him down, again. Gabe S continues to push, while Princess Apple keeps saying she’s uninterested. The crazy part is, Princess Apple has yet to be rude, disrespectful, or even angry at Gabe S–she simply doesn’t want to talk to him. He can’t handle that. After endless messages, Princess Apple finally had her last straw and lost her cool. More power to her for keeping it together this long. Gabe S, like every other man who has this toxic masculinity trait down pat, claims he is actually “genuinely a nice guy.” And, before you know it, he’s calling Princess Apple a judgmental b*tch. Eventually, Princess Apple blocked Gabe S. But, it just goes to show you folks that toxic masculinity is, indeed, toxic.